Schools out (or will soon be) and it is always difficult to keep the kids reading. 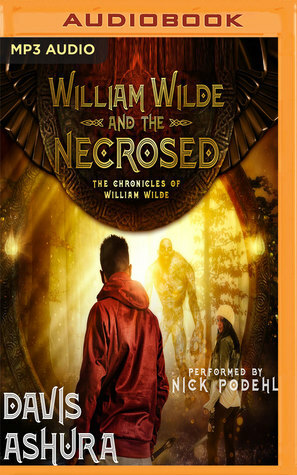 William Wilde and the Necrosed by Davis Ashura will keep your tweens and teens entertained. Get the audiobook and share the experience as a family. 17-year-old William Wilde is orphaned when his parents and brother are killed in a car accident. But there are things William doesn't know about himself, his family, and his friends. In this fantasy adventure, William and his friends are chased by the undead Kohl Obsidian who seeks to destroy William and take his magic. But he may not be the only danger. Who is the new girl Serena Paradiso? Is she on the side of good or evil? William Wilde and the Necrosed is a good kick off to this new series. I liked getting to know the characters and their world. Nick Podehl who narrates the audiobook does a fantastic job of creating distinctive voices for the characters. I was never confused as to which character was speaking. While the kids are high school seniors, I felt like the story was more a middle grades book. It reminded me of Percy Jackson (without the mythology). There is plenty in this book for everyone in your family to enjoy. There's a great group of friends, classic battle of good versus evil and the kids even run off with the circus for a bit. I'm not a huge fantasy fan, but even I enjoyed the book. I think this would make a great audiobook to enjoy on that family road trip you have planned this summer. Or get it free with your free trial of Audible.